This year I’m hoping to fly back to Africa to film the work being done at Mefou Sanctuary in Cameroon. I’m keen to experience and see first hand how different West Africa is to East Africa, as well as looking at the differences in the various sub-species of chimpanzees from other geographical areas. Believe it or not, not all chimps are the same. Like us (humans), chimpanzees show cultural diversity, with chimps living in different parts of Africa developing distinct characteristics. Different communities will show different methods of response for the same behaviours or behaviours observed in any given population. A bit like the north-south divide in the UK…and yes I do have that debate at home, are you kiddin’ me?! The Northerner is a Manc! 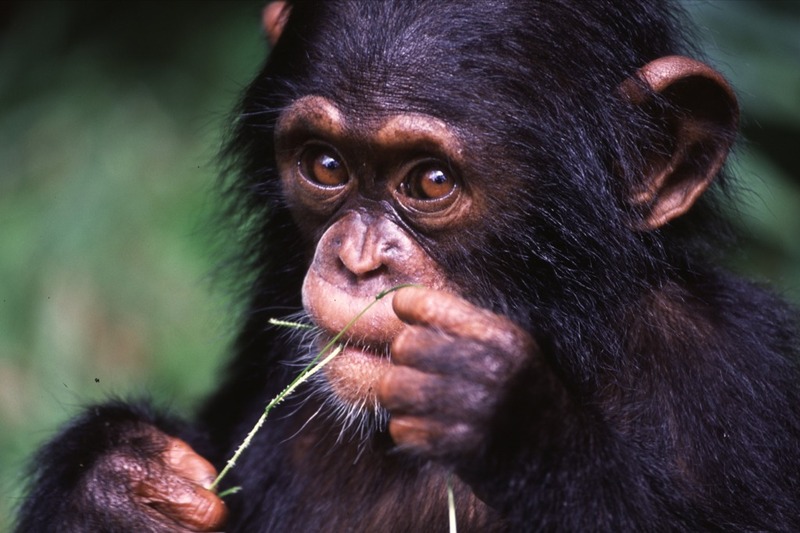 The various sub-species of chimpanzee (Pan troglodytes) are: the east African – Pan troglodytes schweinfurthii; the west African – Pan troglodytes verus, and also Pan troglodytes vellerosus – found only in Nigeria and Cameroon – and the central African species – Pan troglodytes troglodytes. Geographical boundaries (eg: mountains and large lakes) are believed to separate the sub-species. The animals therefore have no way of migrating into different historical ranges unless humans physically put them there, which is why there are very strict guidelines by the International Union for Conservation of Nature (IUCN) if conservationists want to embark on re-introduction programmes back to the wild. I do just want to add for those unaware of the process, that no matter how romantic an idea, it is very complicated, costly and not always a success. It’s still early days for me in terms of my scientific knowledge about primates and my observations of wild populations, so I’d love to be able to gauge the difference between the chimps in Uganda and Cameroon in the flesh. Mefou Sanctuary is one hour from the capital, Yaounde in Cameroon. It’s home to more than 250 primates which include various great ape species as well as monkeys and was set up to rehouse and improve the living conditions of primates that were initially housed in Mvog-Betsi Zoo in Cameroon. The sanctuary is run by the non-governmental organisation and charity, Ape Action Africa (AAA), which celebrates its 15th anniversary this year. In October last year, I had the opportunity to meet the then project manager, Rachel Hogan, during her flying-visit to the UK. Rachel is from Birmingham (and still has her lovely soft Brummie accent!) but has been in Cameroon for the last ten years. She always wanted to work closely with primates and in particular gorillas. 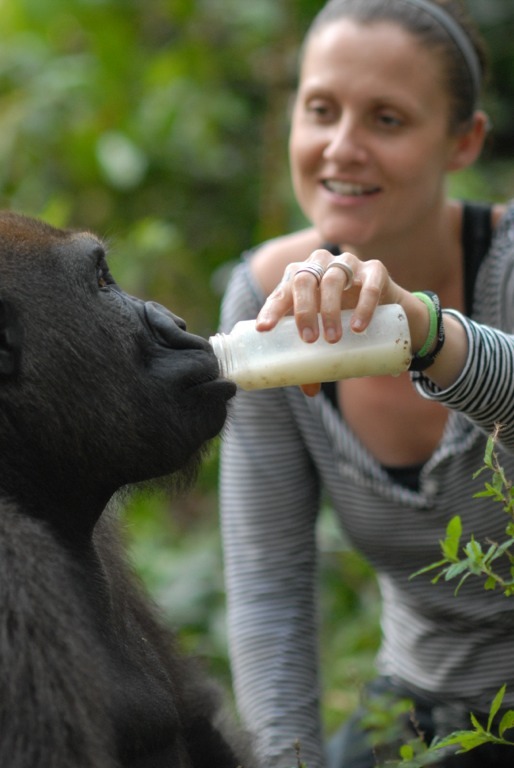 She started off as a volunteer and was meant to go home after a couple of months; but then the arrival of a fragile, 2-week old gorilla changed that and she didn’t have the heart to leave. Rachel gave up her life in the UK to nurse him back to health and has not looked back since. This is Nkan fit and healthy as a juvenile gorilla. Like many of those working in the field, she is committed and passionate. Personally I think she is an asset to the charity and a great ambassador. She’s recently been promoted and has taken over the reigns from the late-director, Avi Sivan. Mr Sivan was not only a dedicated conservationist for AAA but a consultant for the Cameroon military, the security advisor to the President Paul Biya and a retired Israel Forces colonel officer. He ploughed much of his own personal time and money into ensuring the sanctuary ran smoothly. Tragically he died in a helicopter crash in November last year. He’s survived by his wife. Rachel’s promotion has meant that other members of staff have had their responsibilities increased too. Bibila Tafon, who is the sanctuary vet, is now project manager. Caroline McLaney, one of the trustees of AAA said: “Avi had talked about taking less responsibility before the accident and Rachel was seen as his natural predecessor. I wish this promotion was due to different circumstances. 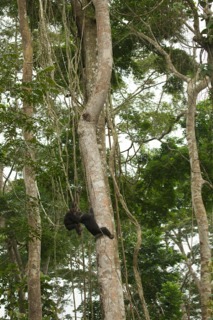 Ape Action Africa relies on donations for the running of the sanctuary. If you would like to make a contribution, then please log onto the website. Do apes and chimps cry? Chimps are part of the great ape family this includes (gorillas; organutans; bonobos or pygmy chimpanzees) and the “lesser” apes (due to anatomical reasons) are gibbons. Animals have the ability to produce tears, but not necessarily for the same reasons that we humans produce them. Whether chimps shed tears due to distress has yet to be scientifically proven. They do demonstrate emotion and they vocalise in the form of whimpering when they are in distress. We produce three types of tears – basal tears protect the eye and keep it moist. Reflex tears flush out the eye when it becomes irritated. And emotional tears flow in response to sadness, distress, or physical pain. Some scientists still insist that the tears released by some animals are strictly for cleaning the eye. Interesting question and thanks for posting it, I may well address this subject in a post soon! Thanks. I asked the question I have seen chimps get emotional with their human pals. They kind of cling on to them like kids. I always felt that animals have more emotions than they show. They could have the same emotional quotient as kids. Aw, this was a really nice post. In thought I wish to put in writing like this additionally – taking time and precise effort to make an excellent article… however what can I say… I procrastinate alot and under no circumstances appear to get something done. Thanks for taking the time to write a comment. Glad you’re enjoying the blog!